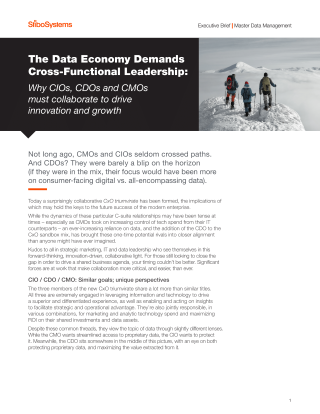 The Chief Information Officer, Chief Data Officer and Chief Marketing Officer need to collaborate to break down data silos across the organization to create and hold a “single golden record” for every customer, product, location, supplier and more. The ability to analyze, integrate and share that data to feed insights and create engagement has become the hallmark of strategic and operational business success. This brief maps out the difference of views in data each CxO might have and how they can join forces in order to achieve data quality success and successful business outcomes.